Each individual emitter pin of the MaxION anti-static bar is coupled capacitively to the high voltage. You will therefore not get an electrical shock when the emitter pin is accidentally touched. 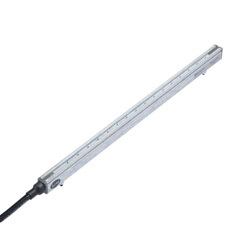 The rugged MaxION static neutralising bar has a reinforced profile that minimises damage due to accidental bending. The ground reference is embedded in the reinforced profile. The slide slot on the backside of the MaxION enables the user to position the mounting bolts as required, allowing greater mounting flexibility. After cleaning the precision emitter pins with a brush you can sweep the contaminants out of each light-angled end of the bar easily. Working distance 400 mm max.